Large butterfly paper clamp is strong enough to hold up to 150 sheets. 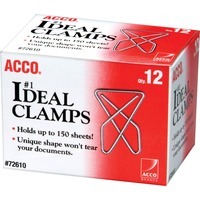 The design of the clamp prevents paper from tearing. 12 paper clamps per box.